Catholic Church in Nigeria has reacted to the call for the sack of Bishop Matthew Kukah from the National Peace Committee by the Buhari Media Organisation, BMO. The Church also noted that Buhari, who met with Muslim clerics in Aso Rock recently and solicited their support for his re-election in 2019, to which the clerics pledged their support, has no right to talk about clerics being partisan. 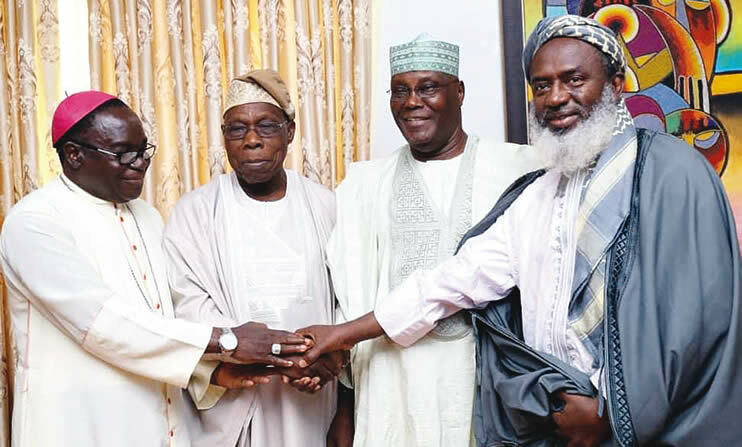 The BMO had called for Kukah’s withdrawal over his presence at the reconciliatory meeting between former President Olusegun Obasanjo and presidential candidate of the Peoples Democratic Party, PDP. The Caritas Nigeria and Justice Development and Peace Commission, JDPC, condemned the call Kukah’s withdrawal in a statement by the Director Church and Society, Catholic Secretariat of Nigeria, Rev. Fr. Evaristus Bassey. JDPC, which is an organ of the Catholic Bishops Conference of Nigeria for relief and development pointed out that it was mischievous, since a man cannot commit an offence by doing his job. The statement said, “The animosity between ex-president Olusegun Obasanjo and Atiku Abubakar his erstwhile deputy, has long remained a national embarrassment. Bishop Kukah and the peace committee have been making efforts behind the scenes for their reconciliation. “These attempts have been on long before Atiku became the presidential candidate of the opposition Peoples’ Democratic Party (PDP). “If the members of the BMO read Kukah’s explanatory notes, they would not come up with the misleading call for his withdrawal from the peace committee. That the move was eventually hijacked and politicised is not Bishop Kukah’s fault at all. The statement added that in 2015 when Buhari was contesting for the presidency, he visited the Catholic Bishops Conference of Nigeria and was given audience. “Why has it suddenly become a crime for a National Peace Committee convener to do his job of facilitating peace between two national figures? “What we want to let the BMO know is that a Catholic Bishop is ordinarily so well trained and experienced, and so full of the sense of the common good, that the only partisanship he may have is what promotes the good of the poor. “If the fear of losing elections that is the main concern here, the BMO should be rest assured that the election outcome would depend mostly on how voters assess this government, and not whether Kukah reconciled Obasanjo with Atiku, that is, if the elections would be free and fair,” he said.